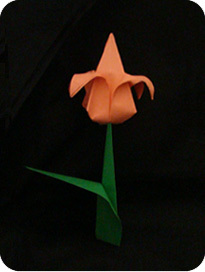 This origami tulip is three dimensional (not flat) and it comes with a stand in the shape of a stem & leaf. 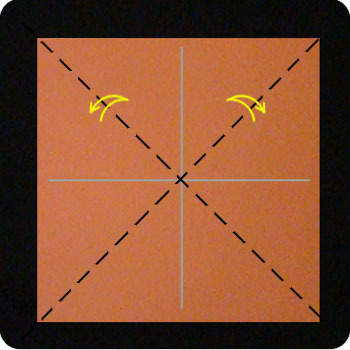 You will need two sheets of paper that is 6″ square in size (or larger). 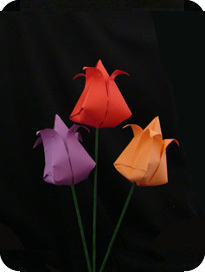 A brightly colored paper for the flower is recommended, and a green sheet of paper is good for the stem & leaf. Though, a slightly larger sheet for the stem wouldn’t hurt. As an alternatively, you can also wrap floral tape around a wooden skewer and use that as a stem (more about different stem origami tulip here). 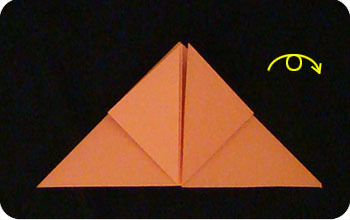 Start with a square sheet of paper: fold it in half (left to right) and unfold. 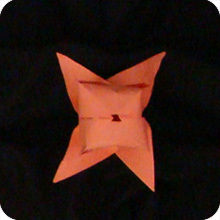 Fold it in half (top to bottom) and unfold. If you are using paper that is a different color on the two sides, then start with the colored-side facing up. 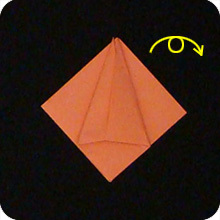 Fold the paper along the diagonals in both directions; unfold. 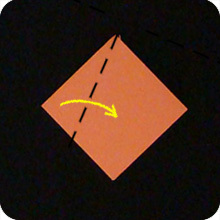 This gives you a “X” shaped crease superimposed on the “+” crease made above. 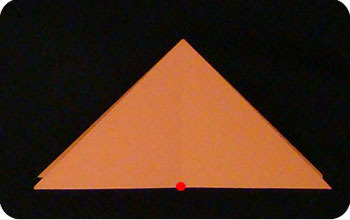 Bring the top-edge of the paper to meet with the bottom-edge of the paper (connect red dots). 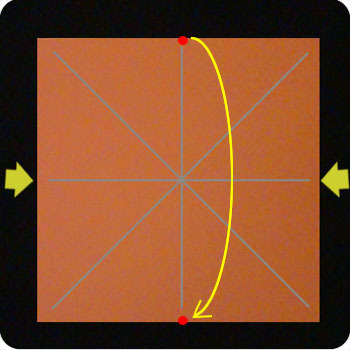 At the same time, push in the left and right sides. 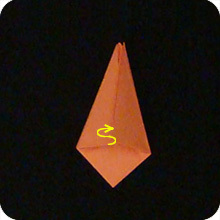 The paper will naturally fold along the creases you’ve already made. Done. 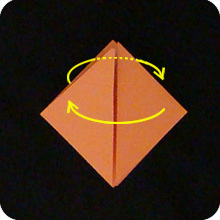 This form is a common intermediate stage used in making various origami models. Working with the top layers only, fold the bottom tips to meet with the point at the top of the model. 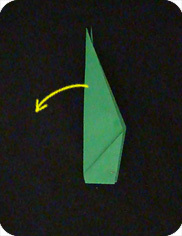 Repeat step 4: fold the bottom tips to meet with the top point. Like turning the pages of a book, swivel one layer from the front-right towards the left side. 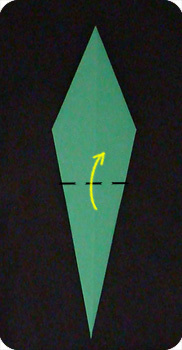 At the same time, swivel one layer from the back of the model towards the right. 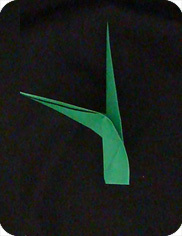 Working with the top layers only, fold the top-left edge of the paper pass the vertical midline. The amount of space you extend beyond the midline is up to personal taste and is not exact. Fold the right edge towards the left. 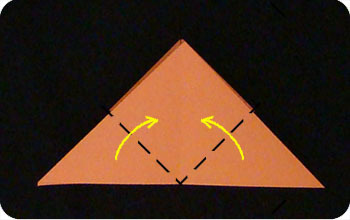 Fold at approximately the same angle as the left flap. The two flaps should overlap a little. 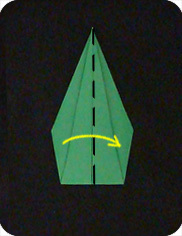 Pry open the layers of paper in one of the flaps. Insert the other flap into this space. The paper may buckle a little and that’s OK. If the paper buckles too much, adjust the folds in step 8 & 9 so the flaps overlap less. Repeat steps 8 & 9 on this side of the model. 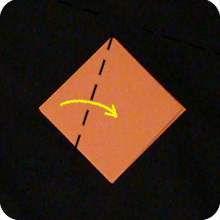 Fold the left side in a little pass the vertical midline. 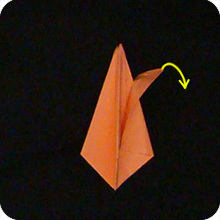 Fold in the right side in a similar manner. 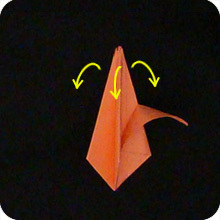 Tuck one flap into the other flap. 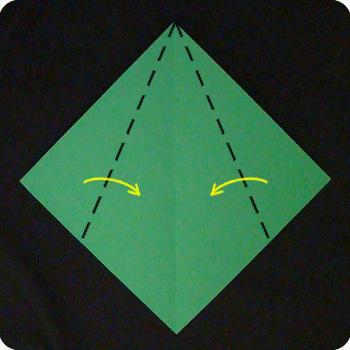 Spread apart the 4 edges so they are as far apart from one another as possible. 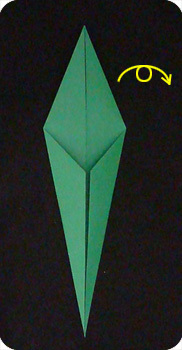 At the top of the model, look for a single layer of paper which you can peel down and away from the rest of the flower. Repeat on the other 3 edges. You should get 4 petals. 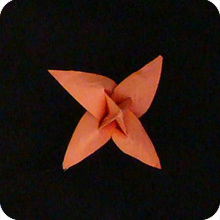 Top view of the origami tulip. Bottom view. Notice that there is a small hole at the bottom of the model. Blow air into this hole so the model puffs up. 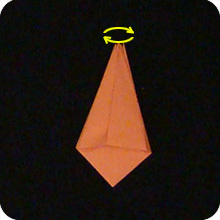 Bottom view of origami tulip after inflation. You can adjust how far down to peel the petals. 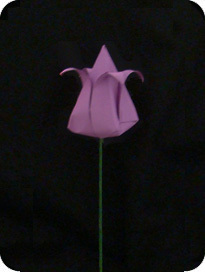 The origami tulip flower is done. Time to make the stem & leaf! 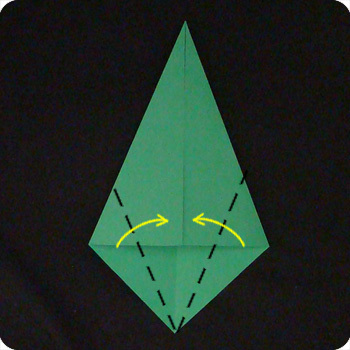 The stem and leaf for this origami tulip is amazingly easy to make – less than 10 steps! It is quite sturdy and can stand up by itself. 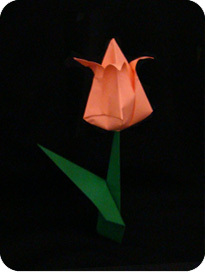 Start with a square sheet of paper of the same size (or larger) than the paper used for the tulip flower. 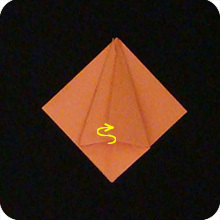 Fold it in half, corner to corner. Unfold. Fold the top-left and top-right edges of the paper to the midline made above. 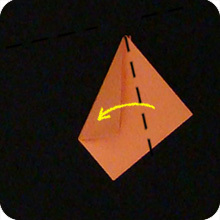 Fold the bottom-left and bottom-right edges of the paper to the vertical midline. 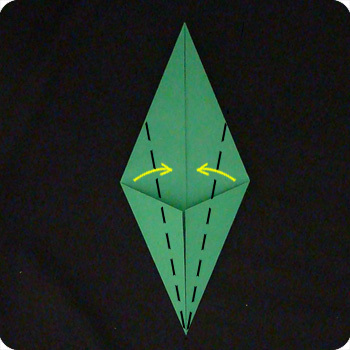 Repeat: fold the bottom-left and bottom-right edges of the model to the midline. This makes the stem more narrow compared to the leaf. 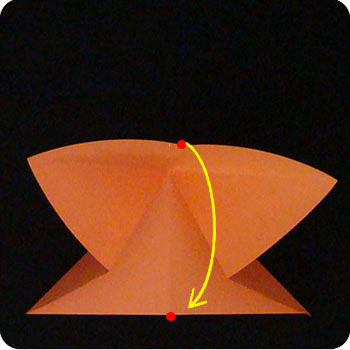 Fold the model in half (bring bottom to top). 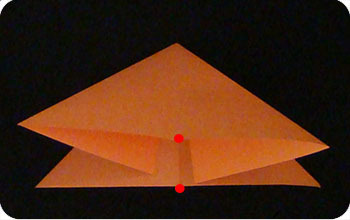 Fold model in half again (left to right). Finally, peel the outer layer of paper (leaf) away from the inner layer (stem). Instead of making the tulips stem with paper, you can also wrap floral tape around a wooden skewer . Poke the skewer through the hole at the bottom of the tulip. 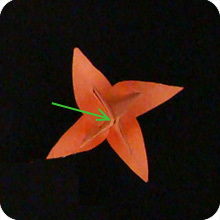 This type of stem makes it easier to arrange the origami tulips as, for example, in a vase or in a bouquet.